Though the administrators, faculty, and trustees of Kew-Forest have changed and its campus and grounds have evolved over the years, its spirit remains as strong today as when it began in 1918. Groundbreaking for its time, the school was established as a coeducational institution that fostered "HIGH STANDARDS OF SCHOLARSHIP, DISCIPLINE AND A SINCERE SPIRIT OF SERVICE." The twin communities of Forest Hills and Kew Gardens face one another across the combined roadways of Union Turnpike and Interborough Parkway in the Borough and County of Queens, City and State of New York. It is between these two neighborhoods, in the early 1900s, that the story of The Kew-Forest School begins. Imagine a time when Kew Gardens was a fledgling residential area with only a few apartment buildings on its perimeter and a scattering of large, well-designed homes on hilly, tree-lined streets; when it was linked to Forest Hills along a “Toonerville Trolley” line, replete with hills and hollows strewn with wild flowers for the picking; when businessmen and local residents traveled through Queens via open trolley in the summer, and in closed conveyances with pot-bellied stoves once the weather turned cold. Given its proximity to Manhattan, this lovely neighborhood soon became a haven of artists, actors, authors, musicians, scientists, business executives, and professionals–many of whom had children who needed to go to school. At the time, the educational options for area residents were limited. There was P.S. 101, of course, but it only ran from kindergarten through third grade. It consisted of a four-room wooden schoolhouse heated in the winter with a round coal stove located in the middle of its main hall. In addition to being drafty, the building had inadequate plumbing and needed to be moved to a different part of the grounds each year. 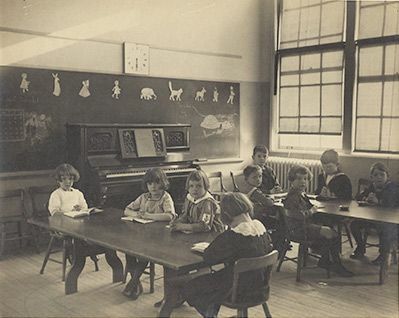 After third grade, pupils had to either travel afield for public schooling, or commute to Garden City, Long Island or Manhattan to find a private school of good quality. In view of these hard facts facing the parents in the Twin Communities, several concerned local citizens began to seek an alternative. After much discussion and planning, they engaged Louis Durant Marriott and Guy Hinman Catlin, both teachers at St. Paul’s School in Garden City, Long Island, to become co-headmasters of a new school that straddled the communities of Kew Gardens and Forest Hills. The group then purchased a two-acre block of land and instituted a local sale of bonds to finance the construction of three buildings, made from brick and stucco, with white trim and green roofs, to be beautifully and faithfully executed in the Georgian style. There were 50 children in attendance on opening day. The very first students enrolled were David Millar, Jr. ‘24, who eventually became an advertising executive and journalist, and his sister Mildred, who became Mrs. Mildred Millar Graff, a famed horticulturist and park conservator. Probably the most celebrated personality to live in Forest Hills Gardens was Helen Keller, deaf, dumb and blind, and a graduate of Radcliffe College. She took a very strong interest in the new school growing on the edge of town and visited it a number of times. Speaking to the children, she answered their questions by holding her hand on the throat, jaw, and lips of her teacher Annie Sullivan, who repeated the questions to her. Many decades later, the underpinnings of academic and intellectual curiosity, community service and global citizenship continue to serve as the three pillars that sustain the school. As the communities surrounding the school have changed, so did Kew-Forest, but always with these three pillars in focus. It is with this strong heritage that the school has been able to adapt and flourish through societal, educational and demographic changes.